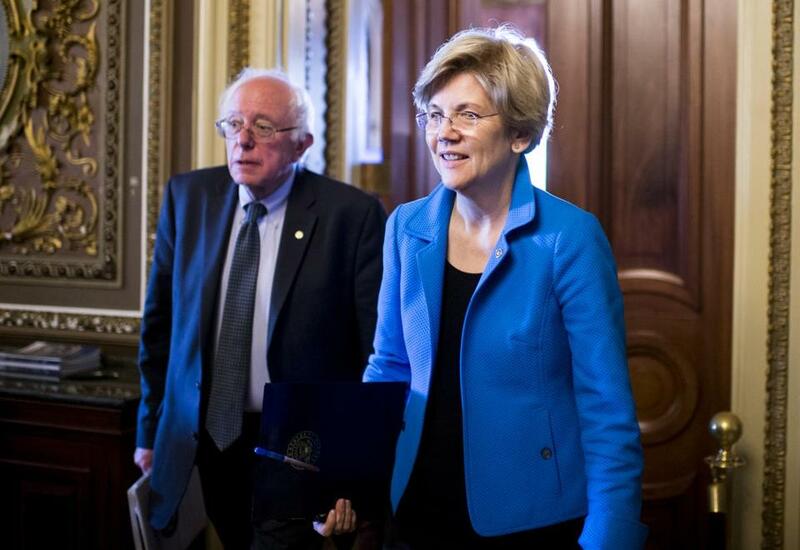 Sen. Bernie Sanders, I-Vt., and Sen. Elizabeth Warren, D-Mass., left a policy luncheon in May 2015. Bernie Sanders did not like to open the phone lines to political critics when he hosted his Friday radio show on WDEV, a shoebox station in Waterbury, Vt. But there was one caller with whom he had no disagreements: Elizabeth Warren, then a Harvard Law professor who would join him for occasional rap sessions about the destruction of the middle class. A dozen years later, Warren and Sanders have emerged from the cozy confines of Green Mountain broadcasting to the center of the Democratic Party’s anguished debate over how to blaze a path out of the political wilderness after the election of Donald Trump. Their history is more fraught and their future more uncertain than their ideological alliances might suggest. But distraught liberals have turned to the two fist-shaking firebrands as the pair they believe can tap into the populist anger Trump channeled among disaffected working-class voters while also fighting Trump’s attempts to roll back environmental protections and civil rights. Still, tensions may lie ahead. Warren is regarded as more of an inside player in the Senate, and was given a leadership position by Senate minority leader Harry Reid, while Sanders, an independent and self-professed socialist, stands proudly and often defiantly apart from his colleagues. Both command loyal national followings, are among the Senate’s most prodigious fund-raisers, and will have to decide when to join Democratic leaders who want to negotiate with Trump and when to oppose concessions. Neither is likely to give up the megaphone. “There really can be only one custodian of the heart of the Democratic base, and I see friction between them,” said Ross K. Baker, a Rutgers University political scientist. So far, Warren and Sanders have signaled similar approaches to Trump’s victory, pledging to join with him if he wants to help workers but fight him if he attacks women, immigrants, or minorities. The two first met nearly two decades ago when Warren was invited to speak at a dinner party for liberal lawmakers at the Washington home of Representative Rosa DeLauro, a Connecticut Democrat. Michael Levenson can be reached at mlevenson@globe.com. Annie Linskey can be reached at annie.linskey@globe.com.